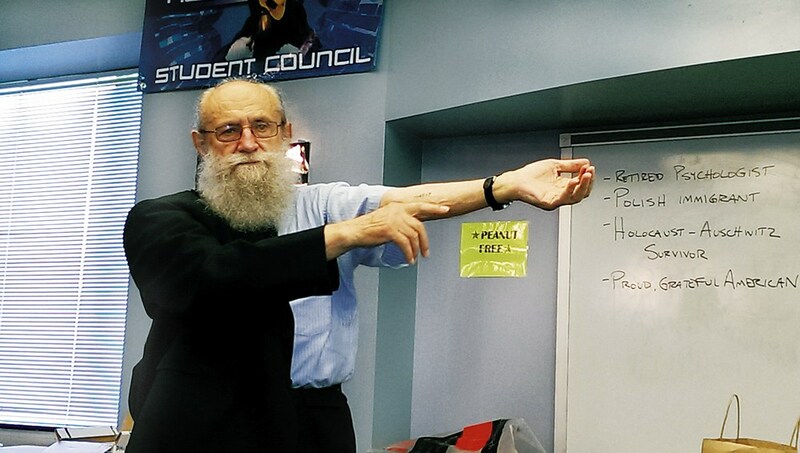 Joseph Hirt points out a number that he had tattooed on his own arm while pretending to be a holocaust survivor at one of the many classrooms in which he has spoken. Hirt was never incarcerated in a concentration camp. Andrew Reid, the New York public school history teacher who says he “believes in truth” has posted his own account of his very thorough investigation into the tales of holocaust survlievor Joseph Hirt on Scribd. online and it is a bombshell. Reid has done in this instance what the media and the schools continually fail to do before they publish a story or allow someone to speak to their students – scrutinize and vet the extravagant claims of holocaust survivors. Of course, the media doesn’t do that because they know the claims won’t hold up; thus one can only conclude the media is helping to defraud the public on the subject of Holocaust. The schools are doing the same out of laziness and mental incompetence. On pages 27-29 of his document, Reid lays out his idea that Mr. Hirt should have an opportunity to publicly retract his claims and admit his fraud, ask for forgiveness and cease his involvement in any further public presentations. If Hirt refuses to publicly recant, Reid recommends that law enforcement in both Lancaster County, PA and Lewis County, NY should pursue a criminal investigation. Right on, Mr. Reid! It has been the case ever since 1945 that only one side was punished; it’s about time these surlievors are held to legal account too. If they were, there would be a lot fewer of them. Well, I think Hirt should be prosecuted whether he recants or not. A crime is a crime, and saying you’re sorry doesn’t get a criminal off the hook in any other field. Why should Holocaust hoaxers get special treatment – or continue to, I should say. I also think his family members should be cited for aiding and abetting his fraud by not speaking up. They’ve known for fifteen years that he was lying in schools and public forums, but said nothing until they were asked by Reid. Interestingly, Reid wrote at Scribd. that “I am not a Holocaust denier – I believe in truth, and if someone is not telling the truth, I wonder what the lie is covering (the”real” truth. )” We have a lot in common! I believe in truth too, and this site Elie Wiesel Cons The World is “A blog dedicated to finding out the truth about Elie Wiesel’s tattoo,” and other aspects of Wiesel’s testimony. Truth is what we’re after. So I am hopeful Mr. Andrew Reid will continue along this path of investigating holocaust survivors. If he does, he might be in for some unpleasant surprises. We must get as many people as possible to read the several items that he has posted at Scribd. His main report contains photographs and background material that is not included in the regular news reports which, however, are very scanty – in fact, I do not see any major media outlets reporting on it yet. That says a lot, doesn’t it. It looks like we’ll have to push it into the news. According to an early local news story, Joseph Hirt has been an active holocaust surliever since at least 2001 when he conducted a 10-week adult night school class about his experiences during the “holocaust.” That led to other speaking engagements and “paved the way for a more intense catharsis: putting pen to paper.” This is a reference to a memoir that he has said he was writing, but obviously with no intention of ever finishing or publishing it. He is smart enough to know it would give him away. 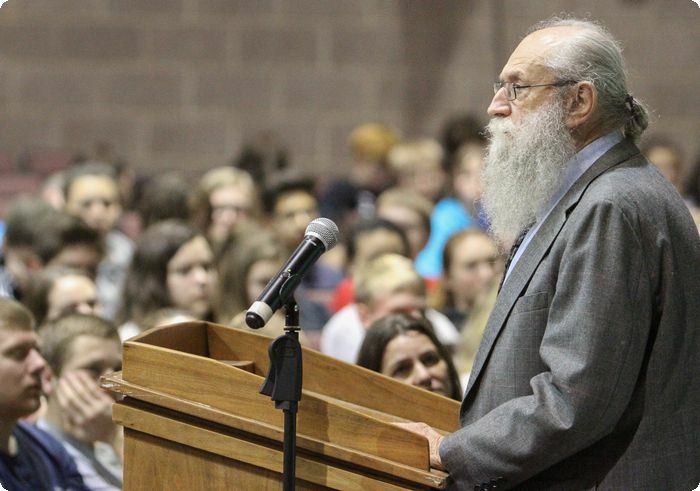 Joseph Hirt speaking to Boyertown High School students in April, 2016. On June 8th, Andrew Reid published the results of his investigation, proving Hirt to be a fraud. No more school talks for him. He gave as a flimsy reason for remaining silent so long (until 2001) that no one would or could comprehend the horror he had to tell. “Even today . . . the mere mention of Auschwitz – the name, the word, conjures up images of whippings, of beating, of hunger, of cruelty, of horrible odors and smells, of burnings, of hanging and shootings, of death and destruction,” Hirt writes (in 2006). Even a friend who became a county court judge continued to believe him. Hirt said that his family is what inspired him to finally speak out. “With two daughters, a son, and six grandchildren, Hirt realized that future generations needed to hear his story.” It’s a fitting irony that today Joseph Hirt has been ostracized by his immediate family and none of his three children will have anything to do with him, according to his nephew. His brother, a retired clinical Psychologist, thinks that Joseph may be delusional and that he actually believes his own stories now. But no … because his nephew Michael says: “When I confronted him (a couple years ago) he basically claimed that the stories were taken out of context, or that the authors fabricated the stories,” which Michael didn’t believe. However very recently, when reached by phone and asked about Reid’s accusations, Hirt, who lives in the Adamstown area now, stood by his story. 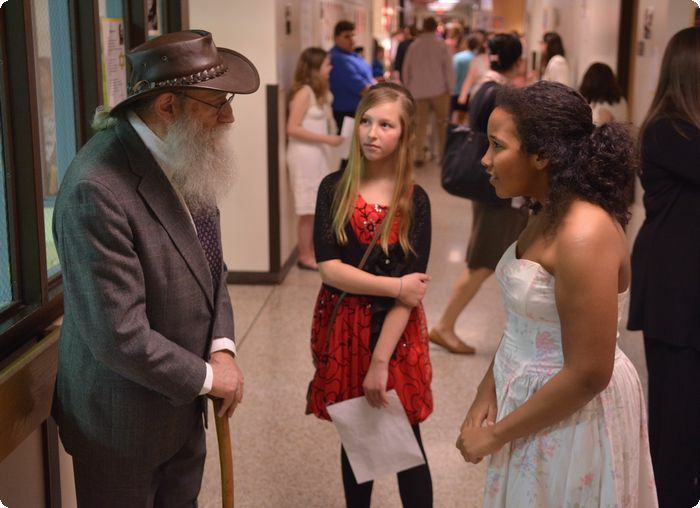 On April 10, 2014, more than 200 students participated in Wilson Southern Middle School’s third annual “Holocaust Hall of Memories.” Joseph Hirt was there, pictured here poisoning the minds of 6th grade girls Samantha Godal, 11, and Jaylinn Maurer, 12. The students do research on a holocaust victim (I guess it was him) and read the story of the victim to family and members of the community. It’s pretty disgusting to see this sick old liar hanging out with tender young girls, filling their minds with horrible stories that have nothing at all to do with their lives. Yuk. The schools are responsible for pushing this unhealthy agenda. 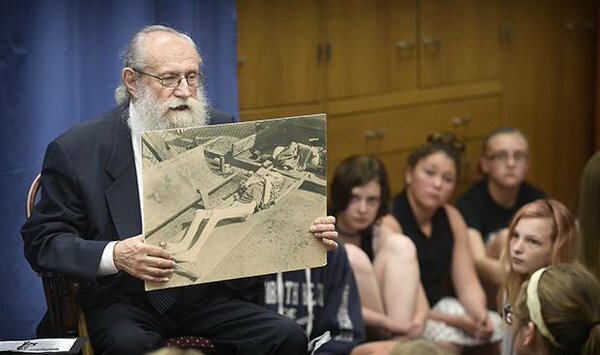 On Tuesday, April 20, 2016, Joseph Hirt, who claims to be 90 though he’s only 86, now a resident of Lancaster County, told his emotional story of surviving the Holocaust to students at the Boyertown High School. 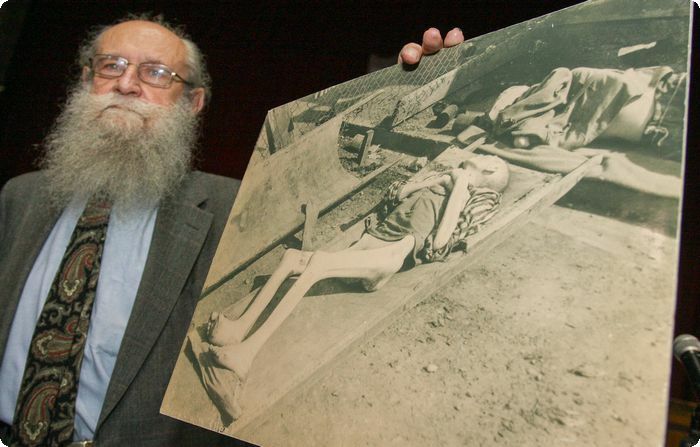 He holds a photo that he claims is himself as a teenager, weighing only 60 pounds, sleeping on a stretcher in the Auschwitz concentration camp. And he tells the students that while in that condition he crawled under a fence, talked a German guard into letting him run away very fast before the guard could shoot him, then traveled to Yugoslavia to find his family. Yikes. Just how stupid are we supposed to be? What does this do to the minds of America’s youth who are told to respect and believe what he says? Another picture of Hirt with that photo of a typhus victim at Dachau taken after the liberation, that Hirt tells his young audience is himself in Auschwitz in 1942, a victim of starvation! Why should young people be subjected to such gruesome images that will give them nightmares. Holocaust “experts” like Deborah Lipstatdt, who took over from Ken Waltzer as the go-to person when frauds pop up (as I wrote about here), are only concerned about how it affects their precious and increasingly fragile Jewish myth. To them it’s sad only because it gives food for argument to “deniers.” They don’t care that schoolchildren are being lied to in their classrooms by speakers they’re told to view with reverence and awe. No, it’s not looked at that way. They believe that everything Hirt says did happen … just not to him. And this is what Hirt believes too, and how he justifies his lies. But I say it did not happen at all since most every surlievor is testifying to things that s/he may have heard about, but did not ever personally experience. What does Deborah Lipstadt have to say about the outing of Joseph Hirt as a liar? Why then was it never clear to Lipstadt? As a “holocaust historian,” she has never questioned a single surliever story. Not a single one! She is only concerned with holocaust deniers. But wait. In Hirt’s story, a few things were discovered to be wrong, and it is agreed by all concerned that those crucial errors discredit his entire story. Why then does Aaron Breitbart say it doesn’t work the same with the official Holocaust narrative? Certain crucial errors should bring about the questioning of the entire narrative. The narrative has to withstand scrutiny in every part if it deserves to be believed. And it is the responsibility of those who claim themselves experts, like the Wiesenthal Center, Aaron Breitbart and Deborah Lipstadt, to police their own “industry,” yet they are absolute failures in this regard. The reason why is clear — they know the whole she-bang is a fraud that it is their job to keep propping up. They approve of people like Joseph Hirt and never question them unless they are forced to. So kudos to Mr. Andrew Reid, a man who cares about the truth. I really hope that, along with following up on Hirt, Reid gets interested in some other surlievors and continues bringing the true facts to light. Be sure to read his report here. On Oct. 17 in New York, actor Tom Hanks became this year’s honoree of the Elie Wiesel Foundation for Humanity. Honored for what, you ask? Well, it’s a little vague. What is written in the news account is “Hanks’ consistent thoughtfulness and concern with his charitable endeavors.” Doesn’t specify what they are, but I looked it up separately and found Hanks is a supporter of a variety of mainly health, i.e. curing disease symptoms, and environmental causes. He is on the Board of Governers of the National Space Society, which is dedicated to the creation of a spacefaring civilization, and he supports UNICEF. At right, Tom Hanks and his wife Rita Wilson with Wiesel at the Elie Wiesel Foundation ‘Arts for Humanity’ Gala in New York City. Oprah Winfrey was similarly honored in 2007. That ceremony was held at the Waldorf-Astoria in New York City. The ceremony for Tom Hanks took place at the New York Public Library, the difference of location possibly having to do with pre-Madoff and post-Madoff. However, Hanks’ award is called the Arts for Humanity award, rather than the Humanitarian Award, which doesn’t appear to be given out every year – the last one mentioned was given to Nicholas Sarkozy in 2008 when he was President of France, for his “steadfast support of Israel.” [Of course, later Sarkozy was accused of “racism” for initiating a program of deporting France’s Roma refugee population back to Romania and Bulgaria from whence they came, which must have disappointed Wiesel and his Foundation staff. ] So is Hanks’ award the same or different from the Humanitarian Award? As with everything to do with Wiesel, it can’t be pinned down. But the question that came up in my one-track mind is: Did Elie pull back his tuxedo jacket sleeve and show the famous actor his vaunted “death camp” tattoo – as a special privilege that he reserves for certain people? Hanks didn’t mention it, so I guess not. There were probably too many people around, anyway. This tattoo-unveiling must take place when no witnesses are present to spoil what is one person’s word against everyone who was not there (i.e. everyone else)! A reader, Laura Bell, has written in to tell us that Elie Wiesel has stated to “her teacher” that he doesn’t show his tattoo because he doesn’t want to say “Oh, look what the Nazis did to me.” He doesn’t want to give them that satisfaction. So that is the reason eh? Well, that apparently didn’t stop him from showing it to Verena Dobnik on the occasion of her interview with him, or to someone (according to Dobnik) at Buchenwald when he was there with U.S. Pres. Barack Obama in 2009. But Verena Dobnik doesn’t want to talk about this singular honor given her past her first claim that she was given it. My emails to her via the Associated Press go unanswered and my phone calls are not returned, even though I am assured “they will get back to me.” When they find out what I want from them, they simply go into hiding mode. The Associated Press has put itself into a bad position by allowing a reporter like Verena Dobnik to include unverified nonsense concerning Elie Wiesel into her news stories. But this particular bit of nonsense is very different from the usual lies about what occurred to any random self-described “holocaust survivor” 70 years ago, or even to Elie Wiesel 70 years ago. This is about right now, and what this woman “saw” on Wiesel’s arm just two months ago, and how it can be verified – because it must be verified. I suggest that Dobnik come forward and answer some questions about what she saw, and the circumstances surrounding it, because we know that Elie Wiesel won’t do so. That’s why we call Elie Wiesel a liar, and now we’re also calling Verena Dobnik a liar … and next will come the Associated Press.